The hidden life cycle of one of nature's most fascinating creatures comes to life with these amazing life cycle figures. 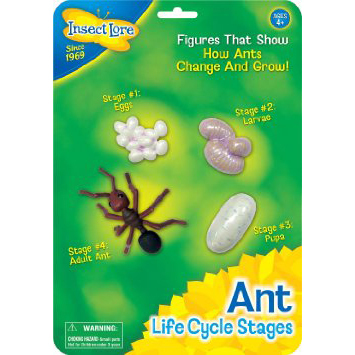 The four stages of the ant's life cycle - eggs, larvae, pupa and adult - have been accurately sculpted and painted. Mix them up and have your kids put them in the correct order. Fun and educational. Ages 4 and up.